Been working on a few new small pieces for the upcoming Little Gems show at the West End Gallery, which opens February 8. As I’ve noted here before, the annual Little Gems show has special meaning for me. It was the first show in which I ever participated and served as a springboard to a career as an artist that I never anticipated. Without that first show, I have no idea what I might otherwise be doing at this time. Pretty sure it wouldn’t be writing this blog. I usually try out some new things for this show or at least try to show some small oddities, pieces with themes or looks that may not find their way into my regular visual vocabulary. 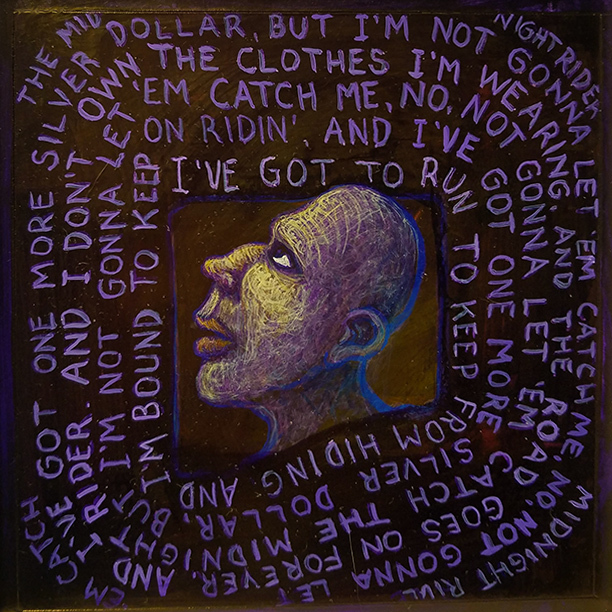 Such is the piece at the top, a 6″ by 6″ painting on panel that is called Midnight Rider, based on and using the lyrics from the classic Allman Brothers song from 1970. Little piece of trivia: This was the A side of a single with another classic, Whipping Post, as the B side. I really enjoy working on these sort of pieces. It’s a different mindset from my normal painting and it has the effect of cleansing the palate. Or maybe it’s palette in this case. These pieces have been fun and freeing. How they fit into my regular body of work, I can’t say. Guess it doesn’t really matter because even though I will show these pieces, they are actually done mainly for myself. For this Sunday morning music, the song is–surprise,surprise!- Midnight Rider. I am showing two versions. The first is from the late Sharon Jones and her Dap-Kings. It was produced for a Lincoln Mercury ad but that doesn’t take away from the strength of the performance. The second is from a performance from the also now-deceased Gregg Allman on the Cher variety TV show in 1975. It features a vintage dance performance from Cher, the kind of thing that was a regularly seen on the variety shows of that time. You don’t see much of this kind of stuff anymore– maybe for good reason. But it’s fun, in a weird kind of way. Take a look and enjoy your Sunday.